The church needs its chronically ill members. God’s Word says that every believer is a vital part of the body of Christ. It is essential that each part contribute to, and receive nourishment from, the body. Even the seemingly weak parts are indispensable; they are absolutely necessary for the body to function properly. If they are disregarded or neglected, the body will suffer. I have lived with a debilitating chronic illness for twenty years. During this time I have been blessed to get to know numerous Christians who also live with chronic illnesses. These people have various needs and spiritual gifts, and they desire to be part of a local church body. Yet, sadly, I hear again and again from Christians with chronic illnesses that they feel forgotten or neglected by their local church. This should grieve our hearts. We must learn to see, and include, the chronically ill as an indispensable part of the body of Christ. 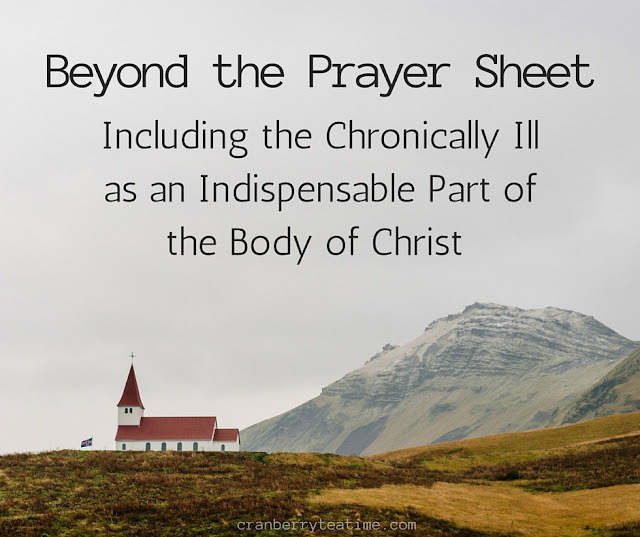 In some churches, ministry to the chronically ill does not extend beyond the mention of their names in a weekly prayer sheet. Praying for the chronically ill in our churches is an important ministry, and one that we should not neglect. It is essential, however, that we go beyond the prayer sheet. The church needs to come alongside the chronically ill to suffer with them and to serve with them. The chronically ill are a vital part of the body of Christ. They have much to offer us, and we, the body of Christ, have much to offer them. Call or send a card when they are not able to make it to church. This simple gesture lets the chronically ill know that they are cared for. It reminds them that they are not forgotten even when they cannot be physically present with the church body. Live stream church services on the church website. This is a wonderful way to include homebound members in the corporate worship service. Providing sermons on CD or mp3 is helpful if your church is not equipped with technology for live streaming. Visit them in their homes, especially if they are homebound. We all need fellowship with other believers, but those who are homebound may not have many opportunities for Christian fellowship. Before visiting, it is helpful to call ahead to make sure they are feeling well enough for a visit. Ask if there are ways the church building could be made more accessible for them. Some things that may be helpful are: more handicap parking spaces, bathroom modifications, ramps, or a recliner for someone who cannot sit up through a church service. Ask if they need help with yard work, meals, housekeeping, childcare, or transportation. Once a church learns what the physical needs of their chronically ill members are, they can help to meet those needs and/or assist in organizing the necessary help. Pray for the needs of the church. Some members may be unable to make it to church regularly, but they can faithfully intercede for the saints. Teach a class with assistance. Some of the chronically ill may not be able to teach a Sunday school class or Bible study all by themselves, but they might be able to help in a class or teach with the help of an assistant. Encourage and disciple others. Those who are not well enough to teach at church may be able to encourage and disciple believers who visit them in their homes. They may have a wealth of wisdom to share from lessons learned through years of suffering with an illness. Be a faithful example of perseverance. Living with a chronic illness takes perseverance. Those who live faithful lives despite daily physical trials will be an encouragement to other believers. By their example, they can teach the body of Christ to persevere and keep an eternal perspective in the midst of trials. Share their testimony. The chronically ill could share about what the Lord is doing in their lives during a prayer meeting or Bible study. If homebound, they could share through a written testimony that is placed in a bulletin or emailed to the church. Through faith in Christ’s sacrifice, each of us has been made a vital part of the body of Christ. The seemingly weak are, in actuality, indispensable. We cannot neglect or disregard a part of the body without causing the body to cease to function properly. Therefore, it is absolutely necessary that we value the chronically ill members in our local churches. Let us look for ways to serve them, and let us accept service from them in return. Let us include the chronically ill as an indispensable part of the body of Christ.